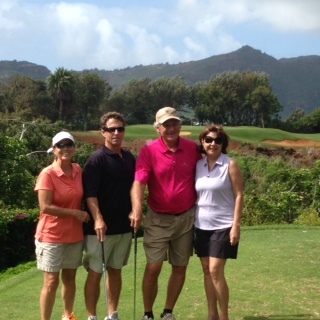 On April 27th, 2014 I played the Kauai Lagoons course with Danny and Linda Lyons of Punta Gorda, Florida. My wife Sally rode along with us to keep score and comment. The weather was good, partly cloudy with moderate trade winds. It had rained a good bit the day before and the wet fairways on the first two holes lived up to our fears. But from then on I was surprised; I had to look hard to find signs of the rain. By the third hole Danny had shifted into machine mode and started cranking out pars and birdies. Linda and I however continued to have an adventurous round and practice our long putts. Danny had the better score, but I think Linda and I laughed more. Any hope I had of scoring well disappeared on the par five 4th hole. I went momentarily ‘brain dead’ and my tee shot missed the golf course – twice. I know to walk around and stretch after hitting a shot OB, but oh no, I just teed up another ball and did it again. Brain Dead. When I came out of my coma, the pressure was off. I can’t come back from a 9 on the scorecard. 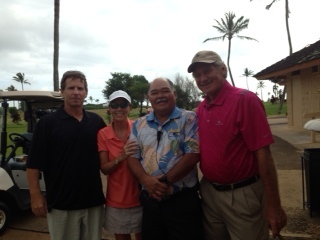 So I settled in and just enjoyed the round – we all did. 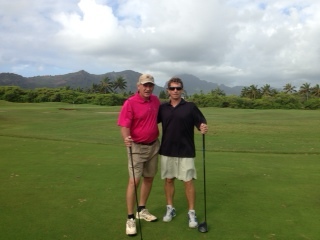 It was a good day to be on a golf course in Hawaii.